Used for #NOF, shaft of femur or fractures of the patella. 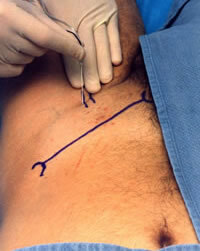 Obtain IV access before performing this technique (risk of LA toxicity). 1% lignocaine in one syringe, with a 25G needle for skin infiltration. 0.5% Bupivacaine in another syringe(22G anaesthetic needle for the nerve block). The toxic dose for Lignocaine is 3 mgs per kilo or 20 mls of 1% Lignocaine for an adult. In a child = 1 ml of 1% plain Lignocaine for each year of the child's age. Before any regional anaesthesia ensure you are familiar with the signs / management of LA Toxicty. You can use a mixture of lignocaine and Bupivacaine. If mixture used then maximum dose should be 2mg/kg in total. Frequency of post procedure observations. A minimum would be at 5, 10, 15, 30 mins post procedure. Content By Dr Íomhar O' Sullivan 26/12/2018. Last review Dr ÍOS 28/12/18.